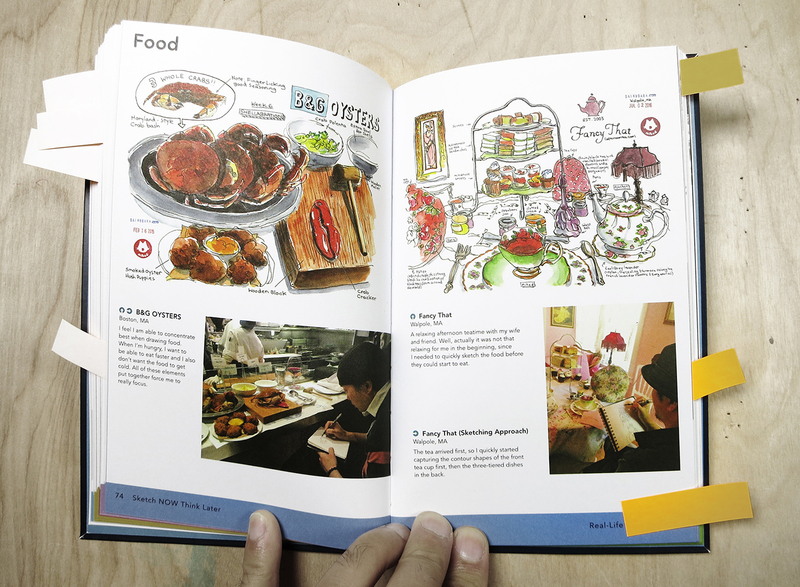 I’ve been a fan of Mike Yoshiaki Daikubara for a while now, so I was pleased to receive a reviewers’ copy of his latest book: Sketch Now Think Later: Jump into Urban Sketching with Limited Time, Tools and Techniques. 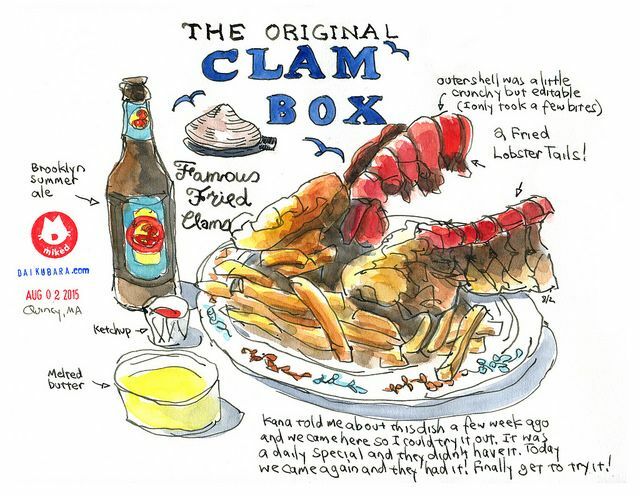 Daikubara is an urban sketcher based out of Boston MA, one of the home towns I’ve collected along the way. Unfortunately, I didn’t street-sketch when I lived there, so I’m catching up on what I missed by following his blog. He’s a prolific sketcher, having trained himself to work fast and use every stolen moment of downtime. That’s no doubt helped him to publish his four previous titles (available online), as well as two more books of early work, now sold-out of print. 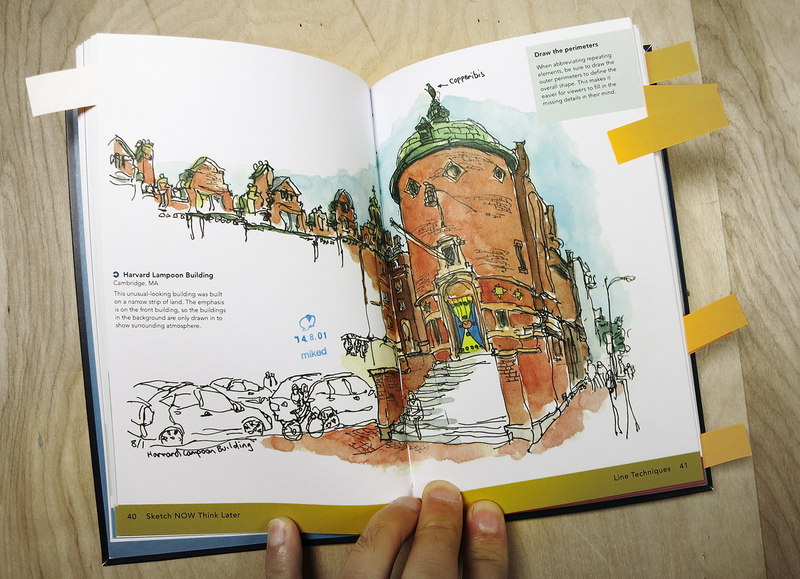 This, his latest book, is a beginners guide to Urban Sketching, published by Quarry Books, an imprint of the Quarto Group. Sketch Now Think Later is a trade paperback book (5.25×8.25”) of 112 pages, looking a bit like a Moleskine sketchbook with an elastic bookmark. It follows the now-classic approach of an Urban Sketchers monograph; starting with a deep dive into the sketching tools Daikubara carries every day, (something every travelling artist has honed down to their personal minimum), and gradually expanding into his techniques for line art, how he handles color, and how he annotates his pages of sketches. 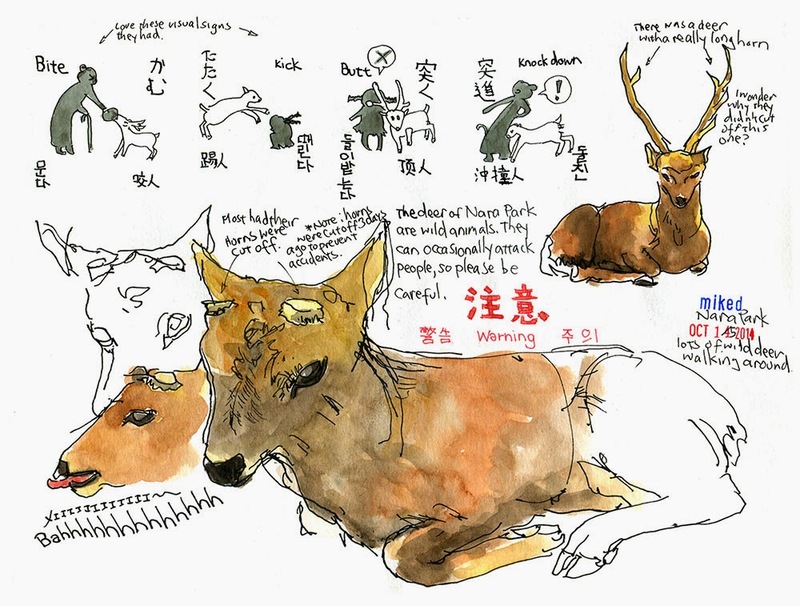 Daikubara, like many Urban Sketchers, is a visual journalist. His drawings are insightful snapshots, not labored renderings. Spontaneous sketches briskly capturing whatever drew his eye, without any wasted energy. The sweet-spot between fine artist and reporter is a balance every Urban Sketcher has to find for themselves. It seems to me he weighs in on the side of obsessive note-taker. His sketches are also his diary; noting down odd details such as laser-sighted measurements of spaces, quoted snippets of conversation, contents of containers, tiny step-by-step illustrations of how things are built, or how they function. (This from his industrial design background no doubt). It’s these annotations that make his drawings fun to pore over. You feel as if you’re over his shoulder listening to him think as he sketches. Always learning something new about his subject. Like his drawings, Daikubara packs the book’s margins with commentary – and they’re where the book excels. 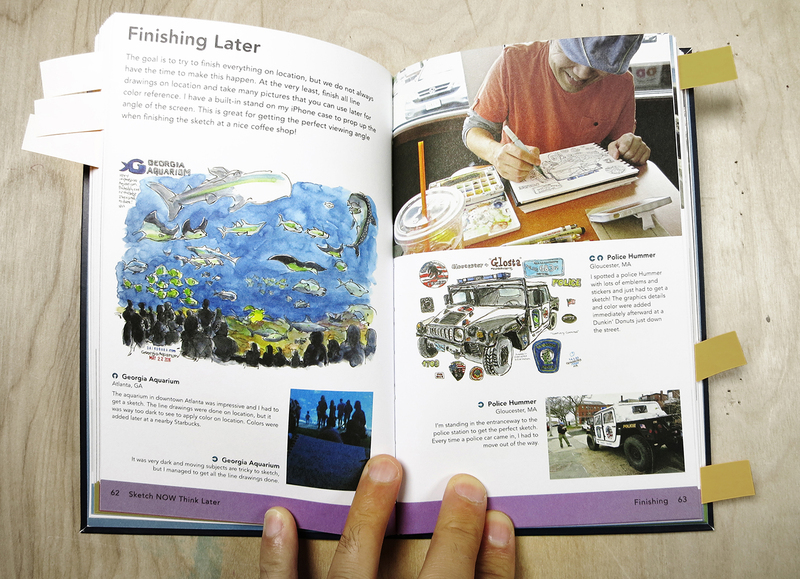 While written for beginners, Sketch Now Think Later is so jam-packed with information, even a practiced sketcher will pick up a thing or two from the many sidebars and captions. The book is available from Daikubara’s site, your local booksellers, or – if you’d like to support my blog, you can order through the Amazon affiliate links used in this article. Thanks to you, I bought this book. It is not only informative but delightful to read. And it really has inspired me not to overthink my sketching and painting. Mike, thanks for the recommendation.